Florida will do a hand recount for Governor and US Senate races…. While Republicans Rick Scott and Rick DeSantis have declared victories? Florida election officials on Thursday ordered a hand recount of ballots in the tight race between Democratic U.S. Senator Bill Nelson and his Republican challenger, Governor Rick Scott. Nelson trailed Scott by about 12,600 votes, or 0.15 percent of the more than 8 million ballots cast following an electronic recount. Under state law, the Florida Department of State must trigger a manual recount if an electronic recount of ballots finds a margin of victory of less than 0.25 percent in the race. Elections officials were expected to inspect by hand any ballots that were designated undervotes or overvotes, cases where the machine that reviewed the ballot concluded that a voter had skipped a contest or marked more than one selection. If the voter’s intentions are clear on review by a person, the ballot could be counted. The order came after U.S. District Judge Mark Walker in Tallahassee, Florida, cleared the way to include ballots from as many as 5,000 people across the state who submitted ballots by mail that were rejected by election officials. A Georgia federal judge issued a similar ruling as that state worked to resolve a close governor’s race. 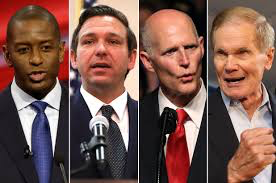 Most Democrats feel that Nelson will follow Abrams in NOT being able to overtake his oppennt in the Florida US Senate vote…. I thought Gov. Scott (R) was ahead and Sen. Nelson (D-inc.) was behind. Andrew Gillum reinstates his conceding the Florida Governor race to Ron DeSantis…. Democrats are unable to get the first Black’s elected to Governorships in Georgia and Florida…. Both elections where closer then anyone could image and both had hints of voter suppression…. Bill Nelson gives up in Florida…. NY Giants post their 3rd Win over Tampa Bay!